I have recently bought a 3 part Allbot leg wich comes with 3 servos. I was pleased with the hardeware so I ordered another 5 to create a 6-leged robot. 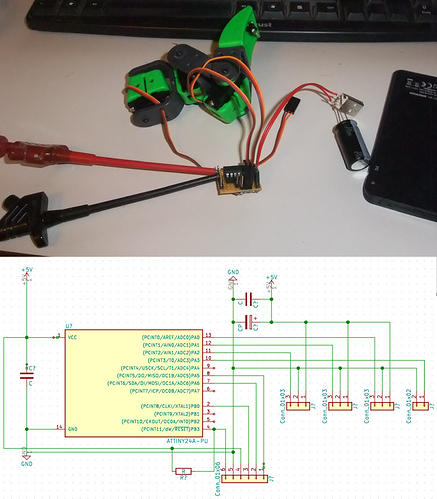 I am trying to contol the servos by a attiny24 and other servos i have do fine with my setup. But i cant get the Velleman servos to worl. Does anyone have an idea of the protocol thes work with? I have conneced them with brown: GND, red: +5V, orange: SIG. My current signal is astandard Servo signal: 1ms-2ms (+5V pulses) at approx 20 ms intervals. are they controled otherwiese? They are standard servos so they should work with standard servo protocol. Is the servo’s correctly powered? As I sad, my other Servo does work fine so it seems not to be the program. But maybe your servos need more power than my powerbank can supply? I will attach a pic. As it is a bit cramped, i will attach also a schematics. I use two power sources, one for the mC and one powerbank for the Servos. I just realised the the scematics is wrong. I connected the center pins of the Servos to the +5V of course. I would suspect that you are drawing too much power. Do the servos work individually if you only connect one at a time? I actually tried it with only one servo. And than combined with the old servo, i had. And I just checked: the power bank can supply 2A (as from from specs). May be the Servos need a bit more than 5V? The electrolyte capacitor is a 6.8 mF one wich I thought should help at motor start.